PRODUCT DESCRIPTION: Odorless material which is applied to the soil around plants, trees and shrubs which works as a systemic. 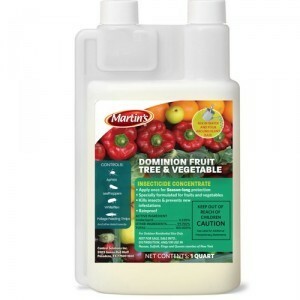 This formulation is safe for use in the garden and can be used on both fruit and vegetable bearing plants. WHERE TO USE IT: Outside the home in the yard for any plant, flower, shrub or tree. RATE OF APPLICATION: Mixtures vary depending on the size of area you want to treat and whether you're treating leafy vegetables/fruits or trees. For most ground growing vegetables and fruits, 1/2 oz per quart of water per 10 sq/ft is sufficient with "days to harvest" in the 7-14 days range. For broadcasting out over the plant foliage, mix 1 oz per gallon of water for every 50 sq/ft. The quart will cover up to 1600 sq/ft. For fruit bearing trees, the rate will vary based on tree size; you'll need to read the label for specific rates or call for help in calculating. TARGET PESTS: Adelgids, Aphids, Armyworms, Japanese beetles, Lace bugs, Leaf beetles (including elm and viburnum leaf beetles), Leafhoppers (including glassy- winged sharpshooter), Mealybugs, Psyllids, Sawfly Larvae, Thrips (suppression) and Whiteflies to name just a few. Yes. In fact when you use Dominion as the label outlines (the most common way to use it will be as a soil drench), the amount of active ingredient that gets into the plant will be minute and insignificant. In other words, the amount of chemical that will be present is so small, it can only affect insects and not mammals (like people). This has been confirmed by testing the product ahead of time to insure it can be safely used in vegetable gardens. And the only reason why such labeling is even granted is because the EPA would never allow something to come to market that might hurt people. To insure this is the case, they make sure ahead of time its safe when used as explained by having it undergo extensive testing. Give us a call if you have more questions or concerns. Can you use this on house plants? 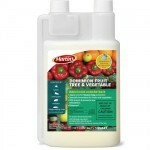 You can definitely use this on house plants; either as a systemic or surface/foliage spray. Its pretty much odorless, safe enough for even plants which yield veggies or fruit and won't pose any kind of hazard to the plant or people.